No, its not a 10-inch axial glide like many are hoping for, but it is new none the less. Or is it? It appears to be exactly the same as the previous 4410 except for the trigger handle. Instead of using the user rotatable handle, the 4310 uses a fixed handle. I was never a fan of the old handle anyways, so this is no loss. There might be some other minor changes, but basically it is the same saw. 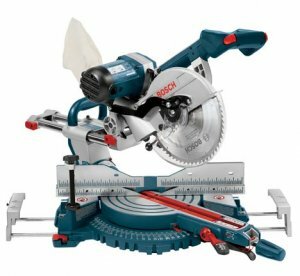 The 4310 will retail for less, so this new model appears to be a way for Bosch to offer the saw at a better value. So now on to the cool news. Bosch has also announced a new miter saw stand. I really liked their old TracRac miter stand, and have been using it for many years now. The new GTA3800 is not a direct update to the TracRac, because it used part from TracRac truck racks, but it does share it s basic design.The biggest improvement appears to be the miter saw mount. It looks like they are much easier to use, and are built better. Bosch says the saw stand has a material capacity of 16-feet, but unless you are cutting 16-footers in half, I have my doubts. I always use a material stand at each end to be able to cut 16-foot trim. Each end support uses smooth rollers that are adjustable in height to match your miter saw's height. Both supports also feature integrated repetitive stops. Bosch also chose again to use aluminum for their stand. So not only is it compact at 62", but it is also light, weighing in at 41 lbs. Light but strong, the GTA3800 can support up to 300 lbs. Some people assume that these foldable compact stands can not handle 12" miters saws, but that is not the case at all.